Urban Transportation is a hot topic these days. Whether it's SEPTA finally getting with the program or new studies showing that Philly is becoming less dependent on cars, the way Philadelphians get to and fro is changing. 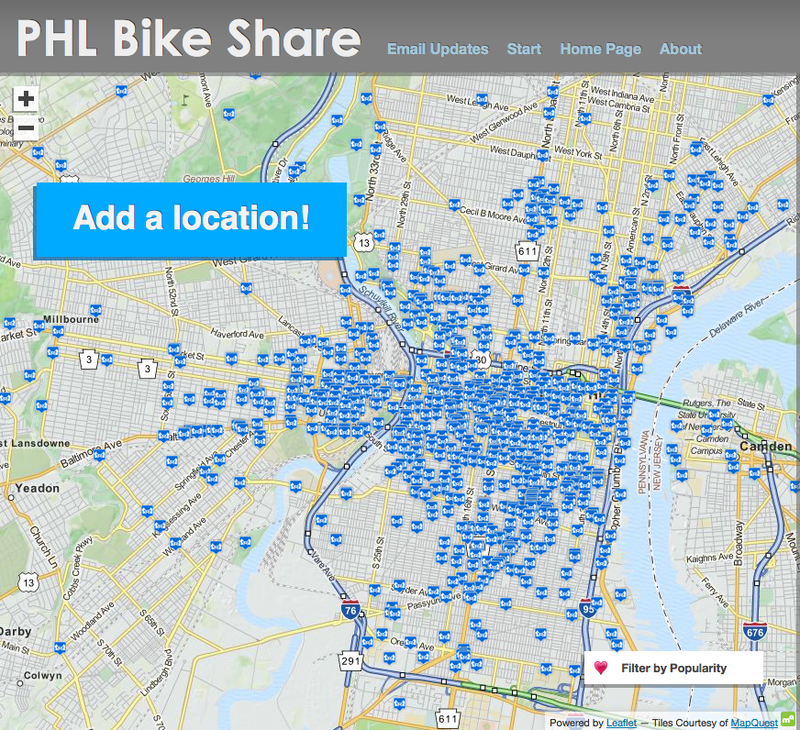 This brings us to Bike Sharing in Philadelphia. Various cities have some sort of bike sharing program. New York has Citi Bike and Washington DC has Capital Bikeshare - it's been on the docket in Philadelphia (check this pic from 2008!) for a few years and is set to launch in the Summer of 2014. Using a bicycle as a primary mode of urban transportation is a growing trend and extremely popular in Philadelphia. As the Passyunk Post has reported, the latest map outlining Zone 1 of PHL Bike Share now includes various parts of South Philly. Unsurprisingly, Pennsport isn't one of those areas. Disappointed by this news? You have the chance to change it. 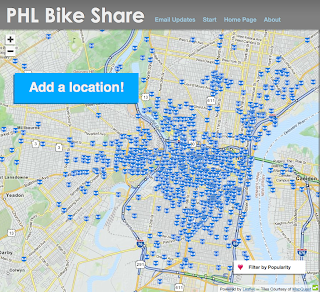 PHL Bike Share is looking for suggestions for docking locations. You can see from the interactive map that some of these suggestions have started to pop up in the Pennsport area - specifically around the developing Piers 53 and 70. These would be perfect locations for these bicycle docks as the Southern Wetlands Park looks to become the primary source of future foot traffic in the neighborhood. Docking stations that bookend Moyamensing Avenue at Washington and Snyder Aves. would also be particularly smart placement. The big question remains: would you participate in the program by, you know, paying to rent a bike from time to time? What dock placement works for you? I would love to hear your feedback on bike sharing. Leave a comment or continue the discussion on Twitter, Facebook, or through email. The weather is finally turning in our favor - so what better way to enjoy your neighborhood than to get outside, have some fun, and meet some of your neighbors. This is the perfect week as the parks of Pennsport offer you some exciting opportunities to do just that. Come out for Movie night this Tuesday at 8pm for an outdoor showing of Ghostbusters. Do yourself a favor and bring your favorite snacks and blanket or a chair to enjoy one of the greatest comedies of all time in the friendly confines of Dickinson Square Park. If you can't make in Tuesday - pick up your favorite produce at the Dickinson Square Park Farmers Market. Held every Sunday from 10am to 2pm, the market features a variety of local goodies and usually a local food truck. Mayor Michael Nutter will kick off Philadelphia's Night Out Against Crime on Monday at Sacks Playground at 4th and Washington Avenue. The event is in conjunction with National Night Out. If Ghostbusters isn't your type of flick (I'm sorry to hear that) - head over to Jefferson Square Park (3rd/Washington) and take in an outdoor showing of Who Framed Roger Rabbit, Tuesday at 830pm. It's a great chance to sit outside and enjoy Jessica Rab - I mean Roger Rabbit, under the beautiful trees at JSP. Bring your chairs or blankets and some snacks. If you have kids chomping at the bit to get outside and run around - turn off Dora the Explorer and head over to Jefferson Square Park for KIDZ NITE. Held every Thursday around 630pm (weather permitting), there are a bunch of fun things for the kids (and parents). It's a great time to get let the kids get their sillies out while meeting some neighbors. Thursday's are a wonderful time in Pennsport. Not only do you have KIDZ NITE at JSP every Thursday in the Summer, but the Mummer Museum offers FREE STRING BANDS UNDER THE STARS as well. Only a block from Jefferson Square Park, the Mummer Museum hosts a new String Band every Thursday in a block party event only Pennsport can give you. Come out for refreshments around 730pm and grab a good seat as the show begins at 8pm. Where can you get some cheap food and beer with some great entertainment for the whole fam damnly? You know the answer - it's Pennsport, baby. Did I miss anything or have an event coming up? Drop me a line - pennsporter@gmail.com and I'll updat the post accordingly.